Thank you for checking out my web site! 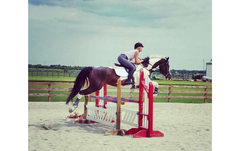 I am Clare VanderWoude, riding instructor and horse trainer. 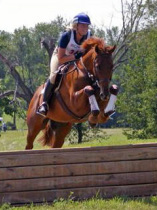 I have been riding since 1992, and competing in the sport of eventing since 1996. I have competed through Preliminary level in Horse Trials and I was the anchor rider for the 2001 Area IV One Star Team at the North American Young Rider Championships. I am a USEA Level II certified instructor, working on my Level III, and am available for riding lessons and horse training in Madison, Wisconsin. I also teach Pony Club clinics and give Certifications, teach eventing clinics, and am available for coaching at Events and horse shows. Many of my students participate in shows and events together as Team V Eventing! You can read about Team V Eventing, who we are and what we're up to this summer, as well as looking through our calendar of events under the Show Schedule link. And check out the slide show! Teaching students of all levels and ages!